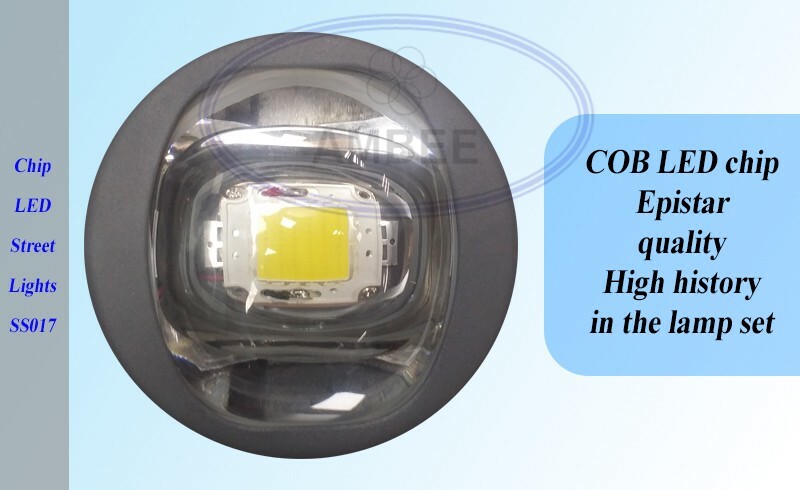 - LED chip: LED street light (LED street light) SS017 uses high performance COB LED chips, this is a special type of special chip for high power LED lamps, the life of this type of chip is good, but Large dependencies and radiators and power supply boosters. 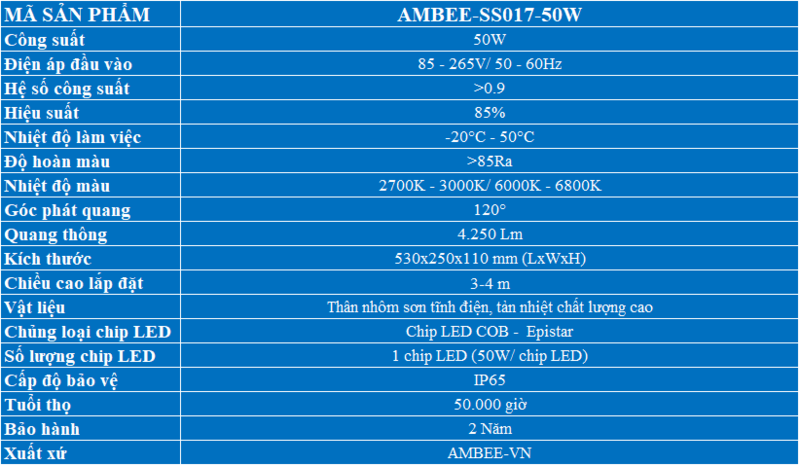 Each COB chip has a standard capacity of 50W, so the heat radiates locally, if the heat dissipation is not good, the LED chip will be dimmed and the color will be reduced very fast and may cause Chip melting. 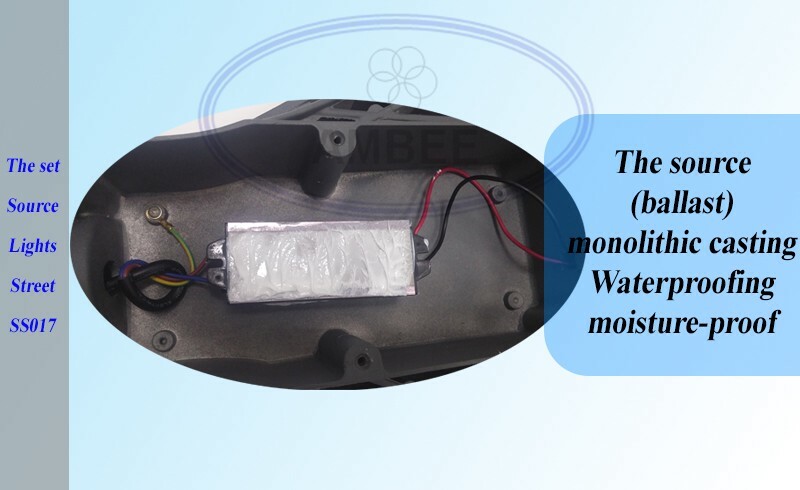 - Increasing LED street light COB (LED street) SS017: This is the second important part of LED light, it helps LED chip to operate stably, without causing interference. 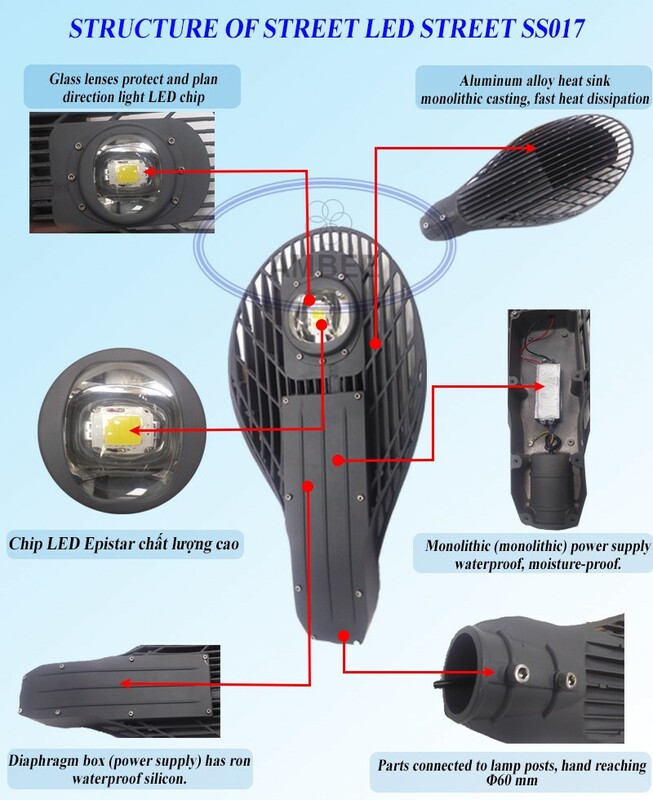 In addition, the life of the LED chip also depends on the ballast (power supply). 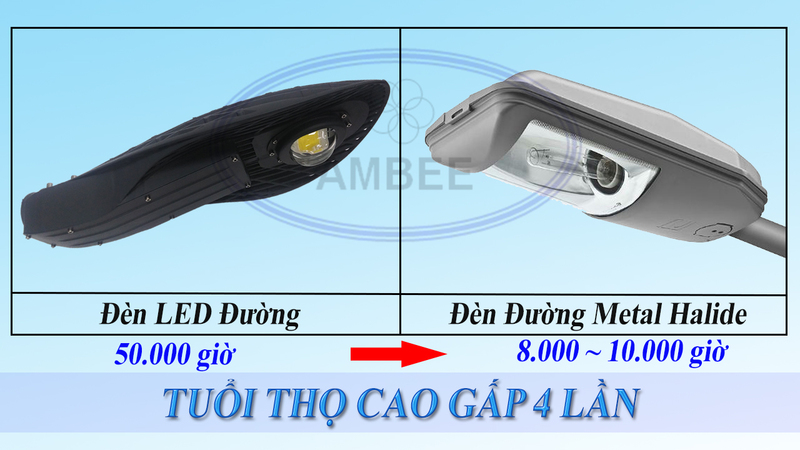 Therefore, why on the market today, the same lamp model, but the price and quality are different. - The main purpose of the Power Supply Unit is to convert the 220V (AC) consumption power into a 12VDC or 24VDC (one-way) power supply to supply the LED Chip. - Aluminum housing cover. The power supply cover is intended to protect electronic components inside the power supply, avoiding dust and moisture from entering the board. - What is more special for this product line is the monolithic molded power supply that has a waterproofing effect and avoids penetration of water and moisture when operating in outdoor environments. 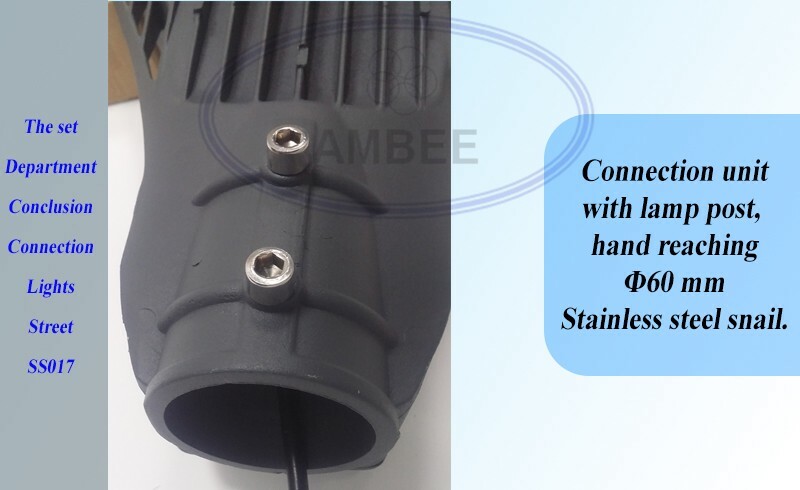 - Radiator for Chip LED street light AMBEE: The radiator is rated as the third most important part of the street light COB LED because it determines the usage time of the Chip. 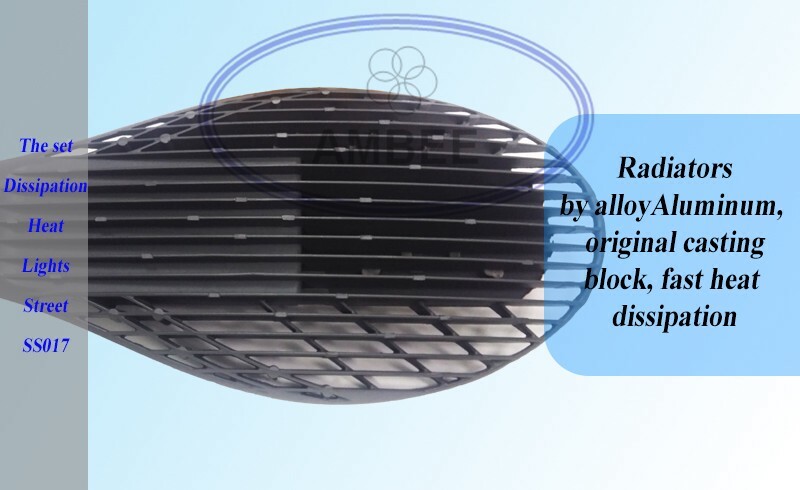 LED chips will lose brightness, reduce color, or even melt chips ... also due to this radiator. Usually the COB LED has a large radiator - very large (depending on the designer & manufacturer will produce different heat dissipation models) - depending on the capacity of the lamp will have different radiators. Quality aluminum made This radiator is very important, if you use aluminum often to make a radiator, the heat transfer capacity is slow and long => Chip deteriorates quickly. But if you use Die-cast Aluminum to make a radiator, it will help heat emit faster, better heat conduction => help make Chip more durable. The special feature of this luminaire is that the radiator is also the body that makes up the shape of the lamp set, the whole body is designed with cast aluminum and shaped like a leaf with many tendons, slits The purpose is to increase the contact surface of the aluminum surface with air to heat the environment faster. - Diaphragm storage box: The ballast box of this luminaire is designed right on the lamp body, this box has a waterproofing standard IP65, with waterproof silicone rims surrounded by the box to prevent the ballast box from being affected. Permeable or impervious when operating under outdoor environments. - The lifetime of the AMBEE street LEDs is 50,000 hours (2-3 years warranty), while Metal or Sodium lamps last 8,000-12,000 hours. Thus, street light LEDs are 4 times more durable than Sodium - Metal street light.